It was an exciting moment on March 24, 2016. 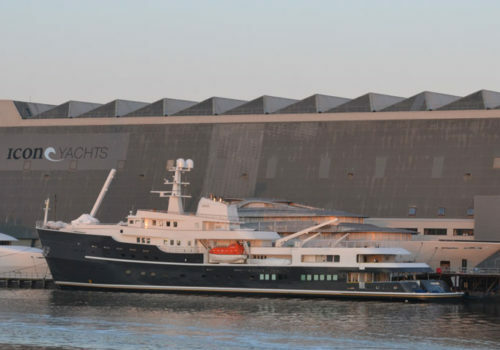 After months of hard work, explorer yacht Legend is launched at Icon Yacht in Harlingen, Holland. The in 1973 IHC built expedition yacht was extensively refitted and renovated, transforming her into an icebreaking passengership with a 1B-Swedish/Finnish classification. She was lengthened in the stern by 3,60 metre, completely restyled by extending the superstructure and rebuilding the mast to make her sleeker and more attractive for future charter guests. More deck space as created for relaxing and enjoying the environment. Heavy cranes were added to lift all toys and tenders one can imagine. The aft deck was transformed into a fully classified helicopter deck. Above that she is fully Lloyd’s and SOLAS certified. Her darkgrey hull gives her the elegance she deserves and makes her stand out beautifully in arctic areas. With a total length of 77.4 meters she is capable of carrying 30 guests in all comfort and luxury one could wish for. Legend is a fully Lloyd’s classified Class, 1B icebreaking ship so she is capable to visit all areas of the world such as the Antarctic’s and the North Pole in safety. The transom is equipped with a swim platform and a large swimming pool / Jacuzzi. Guests who want to explore the world beneath the waves have the possibility to do that in a luxurious submarine, feel like Jacques Cousteau and experience the beautiful watery world. The main deck has a large dining table outside on the aft deck, it is the perfect place for al fresco dining or parties. Inside there is a large dining table and a smaller dining area for intimate diners. The bar provides refreshing drinks and several seating areas are created for some nice conversations. The fitness room, movie theatre, medical suite and spacious guest cabins complete this area. The boat deck has ample lounge and sun spots for some warming up or cooling down, a bar and nice bbq area. Inside are several relax areas and a music corner with a Grand piano and other music instruments for nice live music. The rest of this deck is dedicated to the guest cabins. 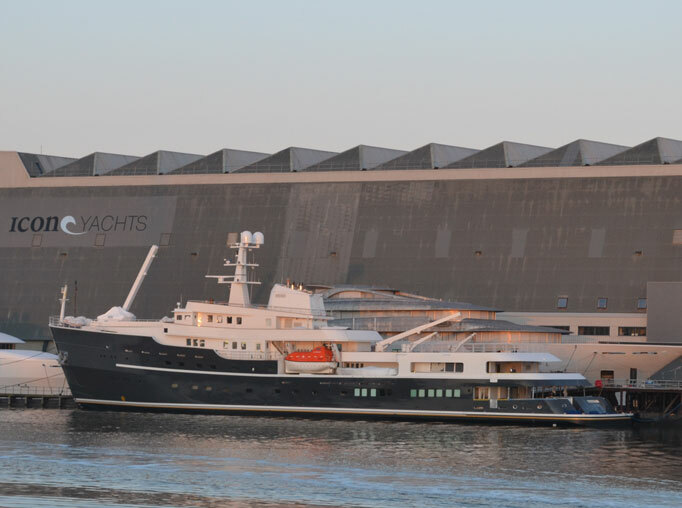 The owners deck has a commercially certified helicopter landing pad on the aft deck. Her enormous master suite, situated on the fore deck, has a king sized bed, a settee sofa, a bar and spacious and luxurious his/hers ensuites with a Spa pool tub, shower, toilet and hand basin.